It's true: Scottish Terriers aren't necessarily for everyone. But if you're one of the lucky ones who finds themselves enamored by the breed, you know you're in for an adventure. 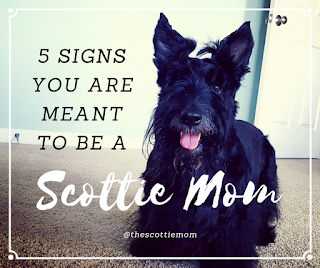 Here are five signs that show you just might be destined to be a Scottie Mom (if you're not already). - You're one tough cookie. Scotties were nicknamed the Diehards for a reason. If you're tough on the outside but a little soft on the inside (although you'd never admit it...you have a reputation to uphold! ), you'll easily relate to a Scottish Terrier's character. 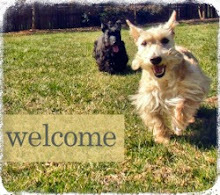 Scottie dogs come ready to take on the world and are fearless in their quests. What remains to be seen is who is the more stubborn of the two: a Scottish Terrier or the Scottie Mom (or Dad)? - You dig tartan. As a kid, you gravitated toward the clothes with little black Scottie dogs worked into the pattern, especially if the garments were black, red, white, tartan or any combination of the aforementioned. As an adult, your taste has matured - perhaps for the finer things in life. Acquired taste and selectiveness is not necessarily a bad thing though...just ask the "Snotty Scotties." - You don't play by the rules. Neither does the Scottie. In fact, if you and a Scottish Terrier went to obedience school, a Scottie might actually do better than you. On second thought, maybe not. - Your favorite character from Disney's classic movie Lady and the Tramp is Jock, even though the story centers on a Cocker Spaniel and a stray dog. Sure, he's a little grumpy in the movie but his character is so well-defined and loveable, you're able to overlook that small detail because his better qualities (loyalty, watchfulness and desire to protect) outshine everything else. - Like the Scottie, you're passionate about the things in life you love and cherish. You may be a bit reserved when you meet someone but you bring nothing but smiles to those closest to you and you do everything in your power to look out for them. 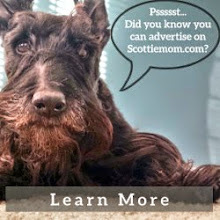 Think you got what it takes to be a Scottie Mom? Take this Animal Planet quiz and see if a Scottish Terrier is your Top Dog and let us know your Scottish Terrier compatibility score! Where's the quiz to see if my peeps are deserving of me???? Hey Kyla - Just click on the words "Animal Planet quiz" in the post or visit http://animal.discovery.com/breed-selector/dog-breeds/questionnaire/page1.html?q=1. I'm sure your Scottie peeps are very deserving! You know, They ARE! 2,700 bucks in vet bills in March weren't scaring Them. As a rescue, I just lucked out. Obviously, I was destined to be a Scottie Mom because I "hit" on all five counts!! I would like to add... A special sense of humour ! Yes, this is me to a "T". My two Scotties did everything the trainer asked - every time. But when we got home, it was like we had never been to school. They have my number in spades. my peep is a scottie peep, no other breed will do! We got Her to do the quizzy thing and guess what - she got the "Scottie" as Her preferred breed. Thank goodness for that! Golly. I'm a match! By the way, Tramp was a miniature schnauzer. I know he was supposed to be a mutt, but he wasn't. FYI. I'M A 96% MATCH. WHAT NOT 100%!! I HAVE MY 9TH SCOTTIE. I WOULDN'T HAVE ANY OTHER BREED. I've had Scotties for 35 years, and hit 94% on the quiz. AND almost all my matches are terriers.